Lohagarh which means “fortification of iron” is a fort right in the middle of Bharatpur city on Rajasthan. Built in the 18th century to commemorate his victory over the Mughals and British, Maharaja Suraj Mal built this magnificent Lohagarh Fort almost in the center of this walled city. He had built two towers, one each for one battle. 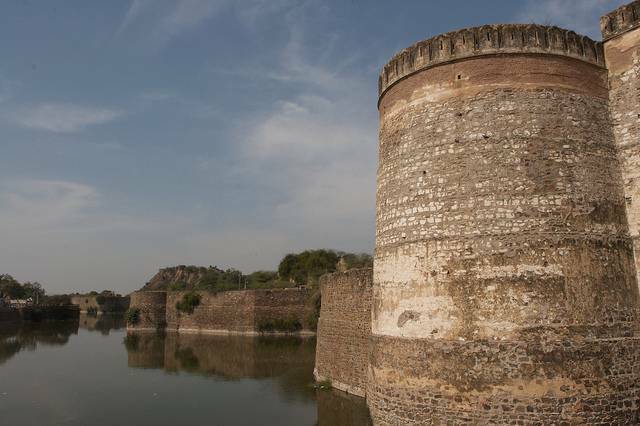 These towers known as the Jwahar Burj and the Fateh Burg are part of the Lohagarh fort. The most magnificent is the palace’s bath place that has still retained its beauty. This invincible fort has deep moats on the outer periphery making it one of the strongest forts in the region giving security to the people of Bharatpur and enduring attacks by both Mughals and British. Part of the fort is used as government offices and there is a State Archaeological Museum inside the fort.